The outsourcing of maintenance work for government owned facilities to private property management companies has grown exponentially in recent years. Three companies — Brookfield LePage Johnson Controls (BLJC), Edon Management, and SNC-Lavalin Profac — have dominated these contracts. In 2009, the top five companies alone received over $64 million in maintenance and operation payments from Alberta Infrastructure, a dramatic rise from the $6.3 million they received in 2006. By 2011, the value of the contracts held by the five top companies had risen again, to over $69 million. Given the value of Alberta’s public assets and the volume of contracts being awarded to private operators, the Parkland Institute undertook to conduct an analysis of the approach compared to managing the facilities in-house. Unfortunately, this investigation was severely hampered by the lack of transparency with regard to Alberta government property management contracts with private firms. Further, Parkland uncovered problems with the metric used to evaluate infrastructure condition, raising concerns about Alberta’s ability to monitor these capital assets. Alberta has failed to make publicly available information that would allow a real assessment of either costs or quality of outsourced infrastructure maintenance. 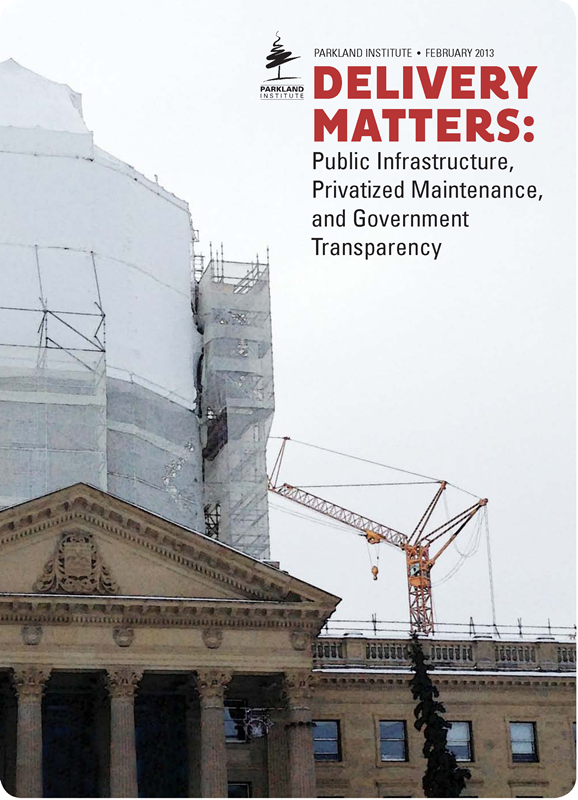 This report illustrates that in the matter of public infrastructure, delivery matters; it matters who is managing and maintaining our public buildings and infrastructure. Using private contractors reduces transparency and accountability and the evidence regarding the cost implications for Albertans is unclear. Given the amount of public spending and the volume of assets in question, these are important concerns. To rely on private delivery of infrastructure maintenance is to risk the mismanagement of infrastructure funds and capital assets. Parkland’s Delivery Matters series has shown overall that using private for-profit companies to deliver public services not only reduces transparency and accountability, but also is associated with higher costs and lower quality services. Given the lack of proper analyses of these risks, the complete lack of transparency regarding the real costs of those public-private infrastructure contracts, and the questionable nature of the companies getting the bulk of the contracts, a moratorium should be placed on further use of private companies to deliver public services. Further, the Auditor General should immediately review Alberta Infrastructure’s Facility Condition Index in order to determine whether it provides an accurate representation of the real condition of the province’s infrastructure.